Truck accidents have a higher chance of causing serious injury to those involved compared to auto accidents with small vehicles. 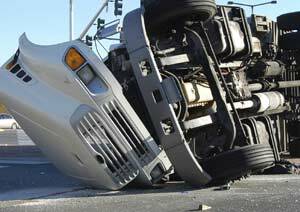 If you are injured in an accident, it is important to hire a truck accident attorney in Tulsa who is experienced in handling accidents with commercial trucks and the companies that own them. Whether you were a pedestrian, bicyclist, the driver of a car involved in the accident or a truck driver, you could receive compensation for your injuries, even if you were partially at fault. Call our team of truck accident attorneys at The Edwards Law Firm today. Although determining liability in a car accident can be straightforward, truck accidents often include multiple parties, such as the trucking company, an insurance company, a contractor or the truck’s manufacturer. A skilled truck accident attorney can determine all liable parties and hold them accountable. Another benefit to hiring a truck accident attorney is the skillset and knowledge a lawyer can bring to your case. While many will opt to file a lawsuit in court, other options also exist that could be more beneficial to the handling of your case, such as arbitration or mediation. An attorney can assist you by choosing the legal course of action that will most benefit you. The use of discovery in a truck accident case is an important part of the legal process, during which time your attorney will conduct a thorough investigation into your accident. An experienced truck accident attorney will use the discovery process to request any reports or documents that support your case and may hire industry experts and accident investigators to determine the exact cause of the crash. A truck accident attorney understands the laws specifically related to the trucking industry that are not applicable to passenger vehicles. Through extensive knowledge of these regulations, your attorney can determine if any violations of those rules or requirements caused the accident. Contact The Edwards Law Firm to discover how our experienced truck accident attorneys can help you after being in a collision with a commercial truck. We will discuss your claim through a free, no obligation consultation to see if you have a case. Our attorneys will pursue maximum compensation for your injuries, lost wages and medical bills as we also work to hold the liable parties accountable. Call today for a free, no-obligation consultation.